To the left is Senate challenger Alison Lundergan Grimes, and to the right is Sen. Mitch McConnell. The U.S. Senate race in Kentucky keeps heating up, and it’s looking to be a record setter. 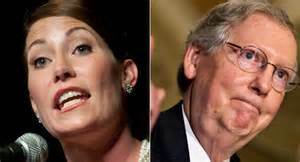 Let’s be honest, whether Democrat or Republican, there is no bigger race to watch than incumbent Senate Minority Leader Mitch McConnell against Kentucky Secretary of State Alison Lundergan Grimes. Right now it’s neck and neck. McConnell is up in two of the four most recent public polls, while Grimes is up in the other two, both showing leads within the margin of error. As the end of July approaches, the campaigns are still getting all their chess pieces in place for the fall, with few solid statements coming from either campaign, but the money being raised by both is impressive. Grimes set a record last Tuesday when she reported raising $4 million in the second quarter of the year, smashing McConnell’s old mark of $2.9 million set leading up to his 2008 re-election. She raised more money in the quarter than any other candidate running for a U.S. Senate seat in America. McConnell meanwhile set a personal best by raising $3.1 million in the second quarter, pushing his overall fundraising thus far to a record $25 million. This is over double the $11.3 million Grimes has raised thus far. Conversely, McConnell’s cash-on-hand advantage has dropped from $9.6 million a year ago when Grimes entered the race, to $3.6 million. Grimes is a formidable opponent. She has contributions from all 120 counties in Kentucky, and is one of the few Senate challengers or incumbents that can claim having received donations from all 50 states. Grimes trouble is she is a high wire act with no net. 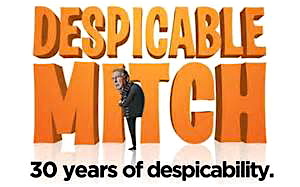 McConnell is a fierce campaigner, which belies his mild appearance, who has a penchant for taking characterizations of opponents and distilling them into oversimplified, but humorously damaging campaign ads. Grimes has little to no room for mistakes or equivocation. Kentucky is solidly conservative, and has a strong distaste for President Obama, even though the Affordable Care Act has proved to be extremely successful in the Bluegrass. This leaves Grimes in the unenviable spot of needing to distance herself from Obama while on some level praising the new health care law, supporting coal and guns, and must also remain attractive to mainline Democratic voters. Helping her out will be McConnell, who has meticulously crafted his role as “Obstructionist in Chief” by basically refusing to allow any legislative activity to proceed for years. This was part of McConnell’s wider political agenda for the Republican Party, in its failed attempt to deny President Obama a second term. That is one way to fly, but it didn’t work out so well for former House Majority Leader Eric Cantor. He had designs on becoming Speaker, but was shockingly defeated in his Republican primary last month. McConnell isn’t exactly popular in Kentucky. He says lots of the right things, but after 30 years in office he is the consummate Washington insider and the face of partisan gridlock. A recent poll found only 32 percent approved of McConnell’s job performance. This was even lower than President Obama’s job approval ratings in Kentucky. With McConnell, he’s more the devil folks know. He’s also seen as having a leadership position, so supposedly that keeps the interests of Kentucky looked after, but it has been a while since Kentucky was really on top of Mitch’s To-Do list. It is predicted that north of $100 million will get spent in this race before it’s over. Both candidates will have the cash-on-hand to get their messages out, motivate voters, run ads and all the other tricks and treats. The question is whether this is a “Ditch Mitch” kind of year, or can a solid run by Grimes make the difference. Regardless, most observers agree that this closely watched Senate race will be the most expensive ever run in Kentucky. This entry was posted in News, Politics and tagged Alison Lundergan Grimes, Despicable Mitch, Mitch McConnell. Bookmark the permalink.